Written by Special Guest Author: Brad Thomas. 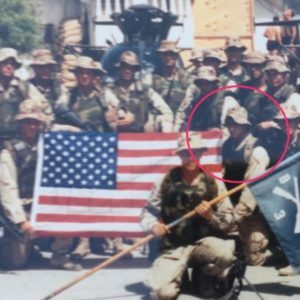 Brad with B co 3/75; Somalia in 1993. If you told me back in the mid 1980’s that I would be where I am today, having lived through one of the most horrific and historical battles in modern times and having retired from the premier counter terrorism unit in the world, I’d never have believed you. Today, so many years later, I’m tapping into my roots as an Airborne Ranger to “set the example for others to follow” to quote the Ranger Creed. 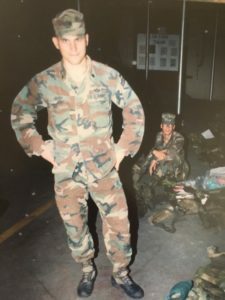 My career in special operations spanned 20 years and took me to almost every continent and almost every state in the U.S., and to every conflict on our planet. In October 2010, after I turned in my badge (the badge that gave me access to the place beyond the fence for 12 years) and drove down All American Freeway with Ft. Bragg, NC in my rear-view mirror, I was overcome with emotions. One main thought kept running through my mind, “I can’t believe that I’m still here, that I’m still in one piece, that I’m still alive.” Underneath my sunglasses, the tears rolled down my cheeks as I thought back to the afternoon of October 3rd, 1993. At some point during an extremely violent part of the battle on the streets of Mogadishu, I found peace in the fact that I wouldn’t likely live that day. I briefly looked up at the brilliant deep blue sky and thought to myself, “As long as I can stare into this beautiful sky as I lay dying, I’ll be ok with that.” The serenity of that thought was interrupted by bursts of 5.56 rounds spewing from my M-249 SAW gun into the waves of militia fighters who were seemingly everywhere. Music has always been in my life. From as far back as I can remember, I was making up songs and singing the melodies. I’ll spare you my 3-year-old mind song titles from those days, but there were some gems as I’ve always been very animated and creative. The first concert I attended (thanks to my amazing and loving parents) was Barry Manilow. I know what you’re thinking, but back in the mid 1970’s, Barry was the bee’s knees. He inspired me, with the help of my parents, to learn how to play the piano and I started at a very young age. 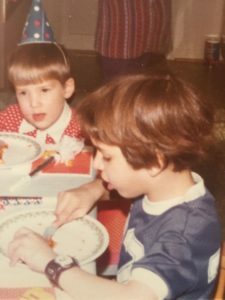 It was the country’s bicentennial when Elton John came along, and my many years wearing a yellow “Captain Fantastic and the Brown Dirt Cowboy” t-shirt. I distinctly remember going to Busch Gardens in Williamsburg the year that it opened, and the teenagers there at Busch Gardens giving me high fives (nowadays called props, kids) because of the t-shirt I was wearing. By 1980, it was AC/DC and my purchase of Back in Black soon followed by all things Van Halen (not Van Hagar), Rush, Aerosmith, Deep Purple, Judas Priest, and most importantly, Black Sabbath. More about Black Sabbath later. As I discovered different bands, my tastes followed a trajectory of sorts starting with what was popular at the time as a young child and gradually became heavier and darker music as I reached my teenage years. Singer Joey Belladonna (L) and musician Scott Ian of Anthrax perform at the Gibson Amphitheatre on October 21, 2010 in Universal City, California. As a teenager in the 1980’s, I was a risk-taking, long haired, wild man who loved partying, watching horror movies, and most of all, playing my guitars. I’d moved on from the piano as I wasn’t able to play the music that I loved on it, so at the age of 13, I picked up a guitar. In those days, I never passed up a good time, or an opportunity to go see concerts or live music at local metropolitan DC venues. I saw a young and not yet known or famous Anthrax at Hammerjacks in Baltimore’s Inner Harbor. 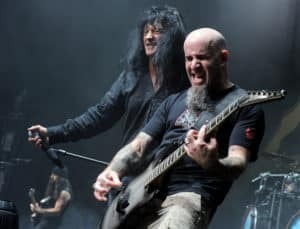 In fact, I hung out with Scott Ian and Joey Belladonna (both in Anthrax still) prior to the show and wasn’t even sure if it was them that I was talking with. Before the days of the internet, the only tool that I had at my disposal to discover and learn about new bands and music, was the physical album, live music, and the record store. My collection of friends and I spent many Saturdays at the various record stores in the DC area, combing the bins for cool album covers, cool sounding bands, interesting song titles, and music we’d only heard about through word of mouth. After an afternoon of skimming thru the vinyl, we’d ultimately end up at someone’s house and crack a few beers and listen to what we’d purchased. For the most part, we had the same musical tastes, but there were enough differences that we could influence one another, and we learned to appreciate what each other liked and disliked in our selections. There was a social aspect to music discovery back then that is lacking in today’s world of YouTube, Spotify, and other resources where music is published virtually, if not entirely, free of charge. I am enthusiastic how easy it is in 2019 to share songs via text as an example, but that’s about it. Young Brad sporting his Emergency! watch. of my earliest memories are from inside that firehouse, especially one Christmas party when Santa rolled into the giant firehouse bay on the back of a thunderous hook and ladder truck. The trucks of that era weren’t quieted the same way large trucks are today, and the noise was literally deafening. Especially to a small child, but looking back at those times, I realize now why being around the firemen and the TV show were both so appealing to me. It was the camaraderie. These men, many of them larger than life, joked with one another and called each other names and nicknames but most of all, they had each other’s backs when things got real. As the 1980’s came to an end, so did the golden era of heavy metal music. It gave way to a new and popular version of heavy metal that was based more on hooky melodies and teased hair than on the dark and real substance that I loved about bands like Black Sabbath. My first few years in B company, 3rd Ranger Battalion were very similar to what I saw in the firehouse but there was one main difference. Death. Death was a very real thing and it surrounded us like an unseen enemy all the time. One of the misconceptions about serving in the military is that “the ultimate sacrifice” only happens on the field of battle. Not true. Training accidents aren’t glorious and thus, receive far less attention than those who are killed engaging the enemy. Truthfully, I know far more that have perished in training accidents and other circumstances, than in combat. So many so, that it’s not even close. My introduction to death in the Ranger Regiment came by way of the rear detachment NCO who oversaw the newly assigned Ranger Indoctrination Program graduates in B company. The company was deployed to Ft. Campbell, Kentucky on a training exercise when we arrived in April of 1991, so the rear detachment NCO oversaw the company in their absence. This NCO was the first I encountered in our new company and within a few weeks, I would find myself in my Class A uniform at his memorial service. The NCO had elected to shoot his wife and then himself and thankfully, he was unsuccessful in killing her. He was very successful in taking his own life. This wouldn’t be the last murder/suicide I’d see while in the Army. In 8 years’ time, there were two others that were successful in killing their spouse and themselves. The average person doesn’t encounter one murder/suicide in their lifetime, but in the span of 8 years, I personally encountered two successful attempts and one near successful attempt. Let that sink in. I’m fairly certain, that the first time I heard Nirvana, I was low crawling down the 3rd Platoon B Company hallway in 1991. Low crawling is a Ranger way of life and it’s the most basic form of individual movement techniques taught to soldiers that starts in basic training. There’s something degrading about low crawling that makes it a favorite form of “remedial training” a Ranger NCO or Ranger Qualified Spec 4 can dish out. At that time, it wasn’t uncommon to walk into the hallway or one of the rooms in the barracks and see a private with their feet elevated on a bunk bed, doing elevated push ups while several privates might be seen low crawling up and down the hallway. Physical fitness and attention to detail were held in very high regard and a mistake in polishing one’s boots correctly, might lead to a three hour long “smoke session” to make the young and impressionable Ranger private understand that attention to detail might be the key to staying alive in a combat situation. Personally, I believed it to be hazing, a good form of hazing that made us all cling together like fire ants to a piece of MRE cracker floating in a rain puddle after a Ft. Benning, Georgia thunderstorm. We were all constantly tested and once we proved we could handle the stress and physical fitness required to be a successful Ranger private, we were selected to go to Ranger School to potentially earn the coveted Ranger Tab. My team leader and role model was younger than me, and he’d participated in the invasion of Panama. SGT Dixon jumped into Panama onto an airfield in 1989 during the invasion and I couldn’t help but wonder what he was thinking about while aboard the C-130 prior to exiting into a sea of enemy tracer fire below. He was hard as nails and could run like a deer. Years later, we would be assigned to the same Squadron in Delta Force but for now, he was just my role model and hero, and he was jamming some seriously cool tunes in his barracks room while making me low crawl down the hallway for some minor infraction. There was something different about this music. It was sonically heavy to some degree, but I could hear a deeper inner turmoil in the vocals and music, and it connected with me. 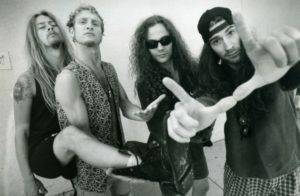 The only other music that I had connected to in 1991 in the same way, was “Alice in Chains.” Songs like “Bleed the Freak” and “Love Hate Love” filled me, hitting that dark nerve that I was living in while the cloak of death surrounded me and my Ranger buddies. Both Nirvana, Alice in Chains, and later, Black Sabbath would play a significant role in my life and future. As I hit the ground near the target building on the streets of c, the enemy rate of fire was already deafening. We had to fight our way to the target building which lead to confusion as to where we were located. Since none of us had ever heard the crack of a bullet, it was disorienting, and the first thing I yelled to my buddy Dom, “What are they shooting at us, .22s?” (I was meaning a very small caliber bullet.) He flashed me his trademark smile which was contagious, and though he was grinning ear to ear, I could see the panicked look in his eyes. It would be the last time we looked at one another, and the last time I would see his smile. My joking nature turned to fear when I saw pieces of the sidewalk and wall behind me splintering. I quickly put two and two together and realized the crack I was hearing wasn’t the report of the weapon but rather, the bullets cracking as they flew past me and impacted all around me. At one point, I watched the vehicle I was assigned to drive down the street. I was next to a Delta guy, shooting down an alleyway, and I realized I would have to catch up to my team. I’m not sure how, but I made my way down the street, solo, a few hundred meters and when I caught up with them, they were using the hummwv vehicle as cover while crossing alleyways. While crossing one extremely volatile alleyway, the vehicle just sat there idle and didn’t move. We started pounding on it to alert the driver, who sat behind a bulletproof door and window, to slowly move forward but the vehicle lurched leaving us exposed to a hail of gunfire. Once on the other side, we all laughed as it was a cartoonish kind of moment in the middle of a terrifying ordeal. I think we were all in shock that with the amount of metal flying at supersonic speed thru the air, somehow it miraculously missed all of us. James “Casey” Joyce (August 15, 1969 – October 3, 1993). Lest we forget. The reality and gravity of the situation hadn’t hit us yet as there were no individual radios in those days, no hearing protection, so communicating and communication was lacking to say the least. We didn’t know then, that we were making our way to where young Ranger Blackburn had fallen from the Blackhawk helicopter. We didn’t know that Blackburn had fallen. We didn’t know anything at that point. After arriving to where that incident took place, Blackburn and another Ranger who’d been killed in action (KIA), Casey Joyce, one of my best friends at the time, would be loaded up and driven back to the hangar where we lived and staged out of at the airfield. All of this was lost on us. What we were doing wasn’t being communicated, and there was also no time to muster in the middle of the street to inform everyone what had happened or what we would be doing. The only thing that was clear to us is that we were fighting for our lives and each of us doing our best to kill as many of them as we could. To follow Brad Thomas please check him out on the Silence and Light Facebook page by clicking here or check them out on instagram by clicking here. Also, check out his latest podcast with our friends at Mentors for Military by clicking here.